Pachauri: "I don't see what a tougher stance (with China) would do"
(CNN) -- The head of the Intergovernmental Panel on Climate Change has rejected suggestions that the United States has adopted too soft a stance on climate change negotiations with China. 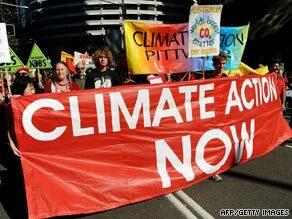 Protesters march through Sydney, Australia on June 13 to urge more government action on climate change. IPCC Chairman Rajendra Pachauri has told CNN that the U.S. is right to absolve China from setting firm caps for national cuts in carbon emissions. His comments came after U.S. climate change negotiator Todd Stern was quoted in China Daily as saying, "We don't expect China to take a national cap at this stage." "I feel that's a very pragmatic view," Pachauri told CNN. "I don't think you'd expect any of the emerging markets to take an actual cut or even a commitment to reduce the rate of growth." Stern was in China last week for high-level talks with his counterpart, Xie Zhenhua, vice chairman of China's National Development and Reform Commission (NDRC). In a press briefing on Friday, Stern described the talks as "very constructive," and emphasized that the while the U.S. wouldn't demand specific cuts in China's carbon emissions, it expected a "considerable" reduction "to where they would otherwise be." Pachauri told CNN that developed countries would be best advised to lead by example and promise specific cuts of their own. "It doesn't make sense to be tough because, let's face it, the developed world really has not lived up to what was expected of them. I think there's a far more productive strategy, a constructive approach would be to first make a commitment to reduce emissions in the developed world, get the emerging markets to take some fairly ambitious action within their own territories, and then we move from there onwards." "If you just keep pushing the Chinese that they've got to make some kind of a commitment for cuts or reductions in emissions intensity, you're not going to get anywhere," he added. China has demanded that developing countries cut their emissions by at least 40 percent from 1990 levels by 2020. It also wants rich countries to donate up to one percent of their annual gross domestic product to help poorer countries tackle climate change. "I think that's an opening gambit in a set of negotiations which in all will ultimately be decided by compromise from all those that are involved. I don't think it defines what's going to happen ultimately," Pachauri said. "China will be certainly be persuaded to accept something lower, I have no doubt about it," he added. Last week, Japan became the latest developed country to publicly commit to specific cuts in carbon emissions. Its vow to reduce emissions by 15 percent on 2005 levels by 2020 was lambasted as lacking ambition, and is a fraction of the cut scientists say is necessary to prevent dangerous climate change. "I think that's not going to be the final word," Pachauri said of the Japanese commitment. "Who knows where the developed world as a whole will end, whether it will be 20 percent or 25 percent or more, but all of this is at least in the realm of possibility given the positive direction that I see coming out of Bonn." Two weeks of talks in Bonn ending last Friday brought together delegates from 182 countries to lay the groundwork for a global climate change deal to replace the Kyoto Protocol, which expires at the end of 2012. It's one of a series of meetings scheduled in the lead up to the U.N. Climate Change Conference in Copenhagen on December 7, seen as the most important climate change talks since the Kyoto deal was adopted in 1997. Pachauri told CNN the progress made at the latest round of talks in Bonn bodes well for a global deal in December. "I think the whole spirit of the discussion it seems to me as being far more productive than one would have anticipated, particularly given the fact that the U.S. is now engaged fully in this part of these discussions in an active way," he said.